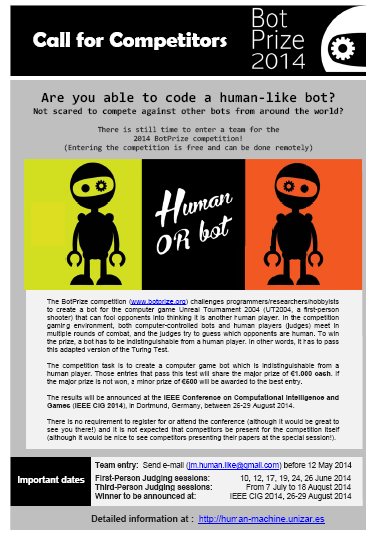 The 2014 BotPrize competition challenges programmers / researchers / hobbyists to create a bot for UT2004 (a first-person shooter) that can fool opponents into thinking it is another human player. In the competition gaming environment, both computer-controlled bots and human players (judges) meet in multiple rounds of combat, and the judges try to guess which opponents are human. To win the prize, a bot has to be indistinguishable from a human player. In other words, it has to pass this adapted version of the Turing Test. The results will be announced at a Special Session in the IEEE Conference on Computational Intelligence and Games (IEEE CIG 2014), in Dortmund, Germany, taking place between 26-29 August, 2014.